Overview: Like sands through the hourglass, so are the days of future present for the X-Men and their extended family. Make no doubt about it, the X-Men title in this era is a full-blown daytime soap opera. You’re going to need a scorecard to keep up with everything going on here in Essential X-Men Vol. 10. Let’s start with Storm, the one-time leader of the X-Men. She is suffering from amnesia, and her body has been reverted from adulthood to childhood. She is getting by with petty thievery on the streets of New Orleans, where she meets the Cajun mutant, Gambit. Will this charming rogue stick around? Speaking of Rogue, she’s back in Australia from the Siege Perilous. But she has been split into two people, Rogue and Ms. Marvel, whose powers she absorbed so many years ago. The two women must fight each other as well as the Reavers for control of the headquarters and for control of Rogue’s body. Who will win? Of course, we can’t tell an X-Men story without involving Wolverine. We get a great stand-alone issue, featured on the cover of the Essential, which tells a flashback story of Wolverine and Captain America saving a young Natasha Romanov, who would one day become the Black Widow. But the highlights of this collection are the two large stories that take up most of the book. 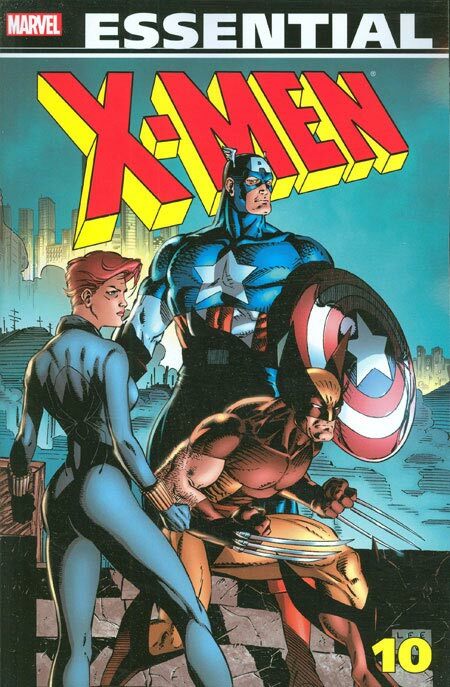 The first is the Days of Future Present story, which ran across multiple annuals in 1991. Serving as a sequel to the original Days of Future Past story (check out Essential X-Men Vol. 2), a grown-up Franklin Richards travels from the future hoping to stop the events that lead to his current situation. This leads to fights between the Fantastic Four, the New Mutants, X-Factor and the various members of the X-Men. Adult Franklin meets young Franklin, Jean Grey meets Rachel Summers, and Cable spends time in the same room with infant Nathan Summers without things going wacky. But the main story that takes up the last half of the book is the X-Tinction Agenda epic. The various teams (X-Men, X-Factor, and the New Mutants) must ban together to finally overthrow the Genoshan government. This storyline wrapped up so many ongoing storylines, with the most important conclusion being the reformation of the X-Men as an official team with a line-up featuring Storm (now returned to her adult form), Wolverine, Banshee, Forge, Psylocke, Jubilee, and Gambit. But the teams did not escape unharmed. Warlock was killed, and Wolfsbane finds herself trapped in her wolf form. She and Havok elect to stay behind on Genosha and help rebuild the government, one which will treat mutants and humans as equals. If you have been reading the X-Men since Giant-Size X-Men #1, then, by all means, pick up this book, if you don’t already have all of the issues. But if you are just getting into the X-Men, you might be better off just focusing on the big epic stories, many of which can be found in their own hardcover or trade paperback collection. Footnotes: Material from Fantastic Four Annual #23, New Mutants Annual #6, X-Factor Annual #5, and Uncanny X-Men Annual #14 are also reprinted in Essential X-Factor Vol. 4. Uncanny X-Men #270 to #272, New Mutants #95 to #97 and X-Factor #60 to #62 are also reprinted in Essential X-Factor Vol. 5. If you like this volume, try: the X-Force series that started in 1991. Following the end of the X-Tinction Agenda story, the New Mutants book was due for a shake-up. Wolfsbane left the team to stay in Genosha and help rebuild the nation. Long-time member Warlock had been killed during the story. New members were joining the team, and the group was now led by Cable. Series artist Rob Liefeld had taken over the writing duties, and it made sense for Marvel to relaunch the title in a new direction with a new #1 issue. Along with co-writer Fabian Nicieza, X-Force #1 became one of the best-selling comics of all time, thanks to the issue being poly-bagged with collector cards. The first year of X-Force has been collected in an omnibus edition, so that might be the best way to track down these stories to read. This entry was posted in Marvel Essentials, X-Men and tagged Chris Claremont, Jim Lee, Jon Bogdanove, Louise Simonson, Rob Liefeld, X-Men. Bookmark the permalink.